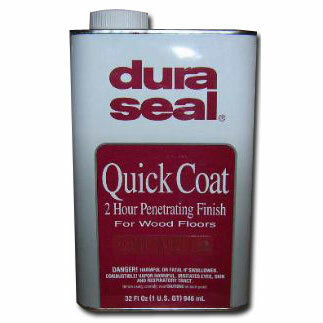 DuraSeal Quick Coat Penetrating Finish 122 Mesquite Red Hardwood Flooring Stain is a semi-transparent stain formulated to seal, color and provide exceptional durability when used on bare wood and masonry surfaces. This rich blend of oil and resin gives hardwood floors a soft, satiny sheen. Its unique formulation provides a surface that can be topcoated in two hours. DuraSeal Quick Coat Penetrating Finish is available in existing DuraSeal colors as well as many Certified Minwax colors ( click to explore Minwax stains ). It can be used with or without a finish coat, and is compatible with all DuraSeal water-borne and oil-modified finish systems. • Dry time and cure: approximately 2-3 hours; note - dry time is based on conditions of 77˚ and 50% relative humidity. • Coverage: first coat - approximately 500 sq.ft. per gallon; optional second coat - approximately 800 sq.ft. per gallon. • Clean up: application tools should be cleaned with mineral spirits or paint thinner immediately after use. - Regularly remove dust and dirt by sweeping or vacuuming; periodic buffing will renew luster. • Penetrating Finish with DuraSeal Renovator Cleaner and Reconditioner. • Storage: Store at room temperature. If stored at high temperature, cool to room temperature before use. Keep from freezing.